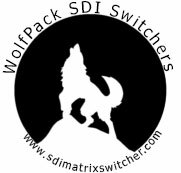 WolfPack Modular Matrix Switcher Add-in Cards are for our WolfPack line Modular Matrix Switchers which are a group of high performance video and audio modular matrix switchers. They are changeable input and output cards which make the matrix extremely flexible and allowing it to be an all-in-one solution for a variety of different projects. The matrix card cage is designed so that it can support a variety of different video signals with cross switching. There are multiple groups of interchangeable WolfPack cards designed to work with the matrix. All of these WolfPack cards are designed to support hot plug & play and each of the WolfPack Modular Matrix Switchers can be used with any of the input and output cards for signal conversion. The ports can be HDMI, DVI, HDbaseT, component, composite, fiber, CCTV and VGA and we can mix and match ports as they are completely customizable.